Morning jam. #padmavati promotions. Grogged out. 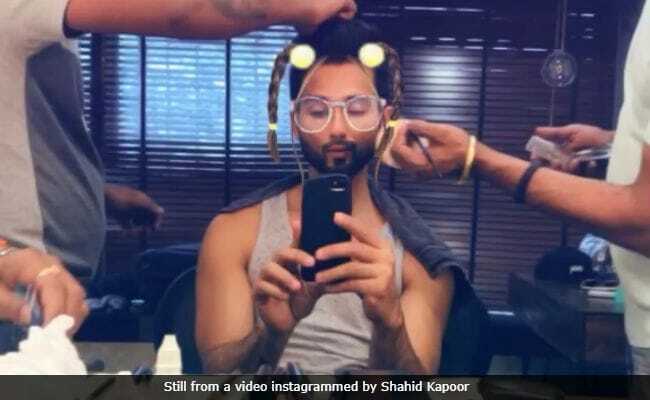 'Drastic makeovers' is not just for Shahid Kapoor's forte. On Monday, Sunny Leone shared these pictures of her extreme change for her upcoming film Tera Intezaar. She wrote: "Becoming a man ain't easy. The team that made it happen! Crazy thing is I look just like my brother and dad. Freaky!" Becoming a man ain't easy! !the team that made it happen! Crazy thing is I look just like my brother and dad. Freaky! And it's not always for work. Sometimes you just gotta have fan. Ranbir Kapooor was recently in new York to take DJ lessons for his upcoming film Brahmastra. All work and no play would have made Ranbir Kapoor dull. But Snapchat was there to save the day (and of course, the Bom Diggy filter). Shilpa Shetty and Tamannaah Bhatia's makeover blended fun and work perfectly. They participated in Farah Khan's show Lip Sing Battle. Shilpa Shetty donned Amitabh Bachchan's Hum look while Tamannaah appeared on the show as Rajinikanth's Enthiran character Chitti, the Robot. We love those extreme makeovers. Dear Celebs, keep them coming.